The Weeknd and rapper Belly cancelled an appearance on Jimmy Kimmel Live! because Donald Trump was booked on the same show. The Oscar-nominated musicians were due to perform on Wednesday's (25May16) show at the ABC chat show host's studio in Los Angeles, according to Editors at the Hollywood Reporter. 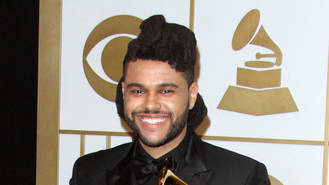 The Weeknd won two Grammy Awards earlier this year, including best urban contemporary album for Beauty Behind the Madness. While rapper Belly - real name Ahmad Balshe - has co-written many of The Weeknd's hits, including The Hills, Often and Earned It, which was part of the soundtrack for Fifty Shades of Grey, and nominated for an Oscar. However, in a statement, the rapper/songwriter confirmed he cancelled his appearance on Kimmel because he didn't want to share a stage with the controversial Republican presidential nominee Trump, and disagrees with his views. Palestinian-Canadian Muslim Belly explained: "I feel like the way I was raised was to be able to see through all the titles in this world — from religion to race. I just didn't want to feel like I was a part of a celebration for somebody who has beliefs that majority of us don't agree with." Trump has been criticised by some political rivals and voters for his inflammatory comments on topics including women, refugees, immigrants and Muslims. He has dubbed Mexican immigrants living in the U.S. illegally "rapists" and called for a blanket ban on Muslim immigration into the United States. "I create songs people go to sleep and wake up to, songs that they fall in love to. For me, being Muslim and being somebody that appreciates my access here in America, I love the fact that I'm able to be here," he shared. "To play my part in this business is a privilege and a beautiful thing. The fact that I could lose that ability through the actions of someone such as Donald Trump isn't right to me. At all." The Weeknd hasn't yet responded to calls for comment. Belly is signed to Jay Z's Roc Nation label. His new mixtape, Another Day In Paradise, is released on Friday (27May). Perrie Edwards is finding her tour jetlag a real killer. Mrs Beckham recorded two full studio albums - Open Your Eyes and the Dash collaboration. James Blake's third album was heavily influenced by Frank Ocean. One person has been killed and three people shot at a T.I. concert in New York on Wednesday night (25.05.16). Blake Shelton has surprisingly purchased the abandoned shop ex-wife Miranda Lambert just closed in his Oklahoma hometown. Royal Mail is set to issue 10 new stamps to mark 50 years since Pink Floyd turned professional. Harry Styles has started work on his debut movie, Dunkirk. Pop star Pink will do whatever it takes to ensure she has a "successful family" after growing up in a broken home. Pop star Demi Lovato had to give up her hairless pet cat because the puss was playing havoc with her allergies.